Looking to work for Essence? We are always looking to recruit dynamic and enthusiastic Beauty Therapists. • Are you passionate about the beauty industry? …we are! • Do you have really high standards in your treatments, appearance etc? … we do! • Would you like to work in an Award Winning Salon? with a fabulous team of girls who are motivated to do their best? 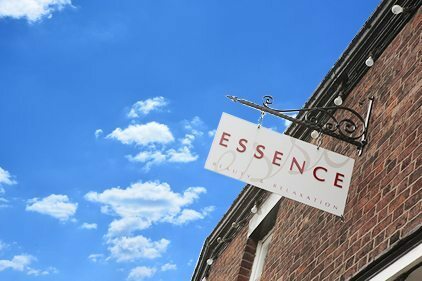 • Essence Beauty and Relaxation has been running for 20 years, and we are currently Clarins No 2 salon for retail sales, in the UK, out of over 200 salons. • Want to work in a salon that is up to date. • You will be given the best training which will include Clarins, Jessica, Guinot and Caci courses. • We offer a great package, Plus lovely clients too! We require credit card details to secure treatments over £20.00 or of 1 hour. Being on good time for your appointment is appreciated, likewise we will always endeavour to run on time to the best of our ability. To enable you to get an appointment when you require with a particular therapist or hairdresser, we suggest you book in good time or before leaving the Salon. When booking your appointment please inform us if you are pregnant, or have any other condition that may affect your treatment. We can recommend alternatives if needed. All treatment times are approximate and include disrobing prior to treatment and consultation. Courses must be pre-paid, are non-transferable and valid for 6 months. If you require to cancel an appointment we request 24 hours notice. We reserve the right to charge 25% of the booking fee for cancellation on the day. All major Credit Cards are accepted. However, a minimum amount of £10.00 is required to use this facility. If under £10.00 a small charge is made. We regret that we no longer accept cheques. Please keep all personal possessions with you at all times. The Salon cannot be held responsible for loss or damage of personal articles. The Salon provides robes for clients to use to protect client’s clothing. We request that all mobile phones are turned off during your visit to the Salon to aid your and other clients relaxation. How can I make my lipstick stay on longer? Investing in a lip liner that complements your lipstick will help. You can either outline your lips or apply the liner over the whole of the lips before applying lipstick. How can I avoid hangnails? Hangnails are caused by dehydration. To avoid, use a good quality handcream and cuticle cream at night before bed. Please dont cut them as they will grow back thicker! Essence recommend Phenomen Oil, Nourish, Jessica Hand Creams and Clarins Hand Creams. I bite my nails and want to kick the habit. What should I do? Try JESSICA Nibble No More – everyday. It contains Bitter Cactus extract which has a revolting flavour. Also have GELeration professionally applied – the gel manicure protects your natural nail and allows them to grow, providing a layer of strength. My nail polish goes thick after a while. How can I stop that happening? Always keep polishes some where cool and out of the sun. Keep the lid clean and bottle upright. To thin polish try Jessica Reward base, add a couple of drops to polish and mix. Is it true that wearing nail polish constantly is bad for nails, as it stops them breathing? This is a misconception. Nails like hair are dead tissue so do not need to breathe. In fact, painting tends to give nails extra strength and helps prevent peeling and splitting. Once a week to keep them clean and hygienic. Use either a specific brush cleaner or baby shampoo, rinse thoroughly and leave them flat to dry completely. How can I make my polish last longer? Always create a good base and make sure the nails are really clean. Apply a base coat, two coats of colour and a top coat. I wear dark shades on my toenails and they are now discoloured. What shall I do? While you wait for the staining to grow out, use Jessica nail whitener as a concealer. To prevent staining always use a base coat to act as a barrier and always remove polish after no more than 3 weeks, as nails are porous and absorb pigment . What bikini waxes does Essence do? We provide a number of different bikini waxes. Please see the diagram for a guide. Do certain treatments require a patch test? Yes. We require a patch test for all technical services, 48 hours prior to treatments. Please note: this include St Tropez Tans. Yes, all of our products are hypoallergenic and not tested on animals. Do treatments require a deposit? We require credit card details to secure treatments over £20.00 or of one hour. What should I know before I book my appointment? To enable you get an appointment when you require or with a particular therapist or hairdresser, we suggest you book in good time or before leaving the Salon. Being on good time for your appointment is appreciated, likewise we will always endeavour to run on time to the best of our ability. All treatment times are approximate and include disrobing prior to treatment and consultation. Please advise your therapist of any changes in your health or medication as this may affect you having certain treatments. What is the validity of my course booking? All courses are valid for six months. They must be pre paid for and are non-transferable. We accept all major Credit Cards, however a minimum amount of £10.00 is required. If under £10.00, a small charge is made. We regret that we no longer accept cheques. How do I prepare for my Eyelash Tint? If you have not had a tint in the past twelve months, you will require a patch test 24 hours prior to the treatment. Contact lens wearers are requested to remove their lenses. Is there a place to leave my personal possessions? Unfortunately, the Salon cannot be held responsible for loss or damage of personal items, so we suggest clients keep all personal possessions with them at all times. The Salon provides robes for clients to protect their clothing. What do I wear after my St Tropez Tan? Make sure to bring loose dark clothing to be worn afterwards. Flip flops are also advised. Please note: A patch test is required before your St Tropez Tan. What footwear should I bring for after my Pedicure? When having pedicures, please bring open-toed sandals to avoid damaging the nail polish. Can I use my mobile phone in the Salon? We request that all mobile phones are turned off during your visit to the Salon to aid your and other clients’ relaxation. Is there a minimum age for ear piercing? The minimum age for ear piercing is nine years old, and they must be accompanied by an adult. What if I am pregnant, can I still book a treatment? When booking your appointment please inform us if you are pregnant, or have any other condition that may affect your treatment. We can recommend alternatives if needed.